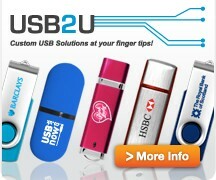 If you want your USB flash drives printed then we can do this for you as well. The prices below are for our White 4GB Trident Model USB flash drive printed with up to 4 colours on BOTH sides of the USB sticks. You can supply a different design, artwork file, logo for the front and back and we'll print on both sides at NO EXTRA cost. All you need to do is place your order and go through the "checkout" process to pay for it and secure the stock. We'll then call you or email you let you know the best way to submit your artwork to us. Once we have this our designers will work up a proof for your comment/approval and then when you're happy we'll get your USB sticks printed for you. We endeavour to send out all orders within 7 working days from approval of artwork but if you need them "super urgent" just call us. The printed USB sticks will either be sent out in individual "bubble bags" to protect them in transit and our prices include Free Delivery to any UK mainland address. 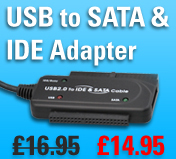 The images shown of this page are of actual printed Trident USB Flash Drives we have supplied. 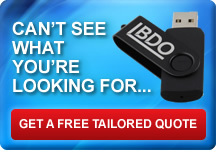 Our designer will take your artwork and apply it to the USB sticks to achieve a "best fit" but nothing will be printed until you are happy and we have your approval. Delivery via UPS within 7 business days of artwork approval.